Manuscript poem & Portrait of Sir Walter Scott. 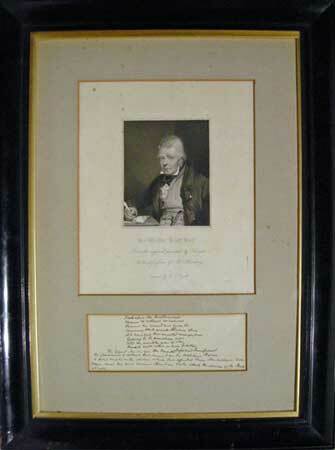 2 5/8 x 7 1/8" handsomely presented with a portrait of Sir Walter Scott Bart. engraved by H.T. Ryall from the original portrait by John Prescott Knight, published London 1835. Steel engraved proof including letters. 8 x 4"
Mix'd with what we now behold. below which is continued a five line note on the Grand master Dom Manuel. The whole being matted, glazed and set into a black wood stained frame 21 1/4 x 15 3/8" with original Doig, Wilson & Wheatley of Edinburgh, Fine Art and Printsellers framing label and leaf from book of the printed version of Byron's poem on verso. Scott was deeply interested in the poetry of Lord Byron and published a review of Childe Harold in 1816 and an article on Byron’s character in 1825. The Poetical Works of Lord Byron. Collected and Arranged with Notes by Sir Walter Scott, Lord Jeffrey [And Others] was published in 1851 and this manuscript fragment may well be part of Scott’s notes for that publication. Scott first met Byron at Murray's house in London. From this first meeting, they formed a great friendship that was to last until Byron's unexpected death in 1824. The Deformed Transformed was written in 1822 and in which Byron sought to combine the solution of a metaphysical puzzle or problem, the relation of personality to individuality, with the scenic rendering of a striking historical episode, the Sack of Rome in 1527.